Representatives from the U.S. Department Housing and Urban Development, office of Assemblywoman Monique Limón, office of State Senator Hannah-Beth Jackson, office of Congressman Salud Carbajal and Chamber of the Santa Barbara Region joined Santa Barbara Mayor Cathy Murillo and Peoples’ Self-Help Housing for a ribbon-cutting ceremony. View more images here. 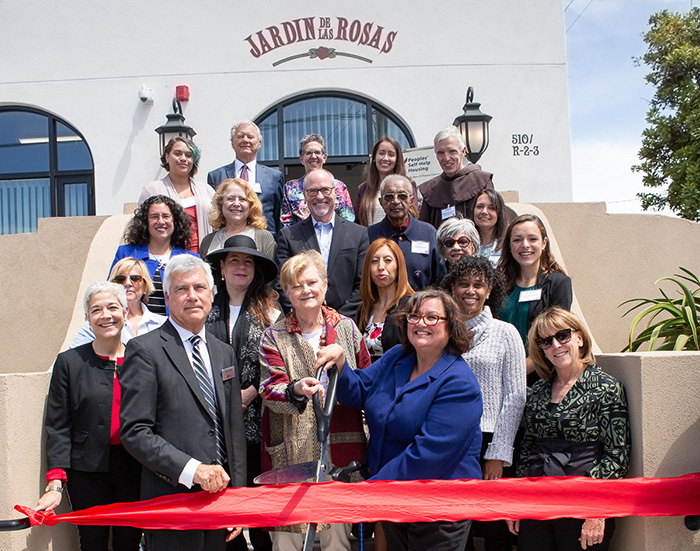 Santa Barbara, Calif., April 27, 2018 – Peoples’ Self-Help Housing’s (PSHH) celebrated the official opening of its newest development in Santa Barbara, Jardin de las Rosas (JDLR), with a special grand opening and ribbon cutting ceremony on April 18. “Our team at Peoples’ Self-Help Housing has been looking forward to this day for a long time, and we’re thrilled to finally celebrate the addition of 40 affordable housing units to the Santa Barbara community,” PSHH President & CEO John Fowler said to the approximately 100 guests in attendance. The 40-unit JDLR, located at 510 N. Salsipuedes Street in downtown Santa Barbara, is a Platinum GreenPoint rated development that features the Michael Towbes Community Center, the Jeanette Duncan Learning Center, a multi-purpose room, staff offices and an interior courtyard with a tot lot, playground and a specially commissioned 60-foot-wide mural designed by local artists Phoebe Brunner, Cynthia James and Masha Keating. JDLR is also a part of a priority housing overlay zone identified through the community input process. It is one of the first projects approved through the City’s pilot program under the new ordinance and a key implementation in the City’s General Plan. In addition to celebrating the new development, the Grand Opening ceremony also recognized Michael Towbes and Jeanette Duncan, namesakes for the community center and learning center respectively. Michael was an influencer and an investor who knew that a safe home and a great neighborhood was the start of so many good beginnings. He supported numerous PSHH developments, including Villa de la Esperanza in Goleta and Victoria Hotel in Santa Barbara. Michael also served on the Board of Directors for The Duncan Group, PSHH’s property management affiliate, and supported programs and services through The Towbes Foundation and Montecito Bank & Trust. The learning center honoree, Jeanette Duncan, was at the helm of PSHH for more than four decades, leading the affordable housing movement on the Central Coast and beyond. Fearless and forthright, Jeanette built homes, families, character and bright futures for thousands of residents. Funding for the first year of educational programs through the learning center has been generously provided by the Women’s Fund of Santa Barbara, Williams-Corbett Family Foundation, Pacific Premier Bank and First Republic Bank. Funding agencies for JDLR include California Community Reinvestment Corp., J.P. Morgan Chase, City of Santa Barbara HOME & Redevelopment, Goleta Valley Housing Committee and Enterprise Community Partners. Development partners include Peikert Group Architects, LLP, RRM Design Group, Landscape Architect Robert Andrew Fowler, Civil Engineer Stantec and Ashley & Vance Engineering Inc. Founded in 1970, PSHH is the largest nonprofit affordable housing developer on the Central Coast. With a mission of building homes and providing services to strengthen communities and change lives, PSHH serves low-income households, working families, seniors, veterans, those living with disabilities and the formerly homeless. It also provides homeownership opportunities through an owner-builder, “sweat equity” program that has seen nearly 1,200 homes successfully completed. Through its properties and offices, PSHH has a presence in San Luis Obispo, Santa Barbara and Ventura counties, manages over 1,800 rental units, and employs nearly 200 staff members. For more information on PSHH, visit www.pshhc.org, email info@pshhc.org or phone (805) 781-3088.